During a brief visit at Japanese ship model manufacturer Woody Joe by Hyde Street Pier Model Shipwrights member Clare Hess, a gift of HSPMS hats was presented to the company president and chief design engineer. 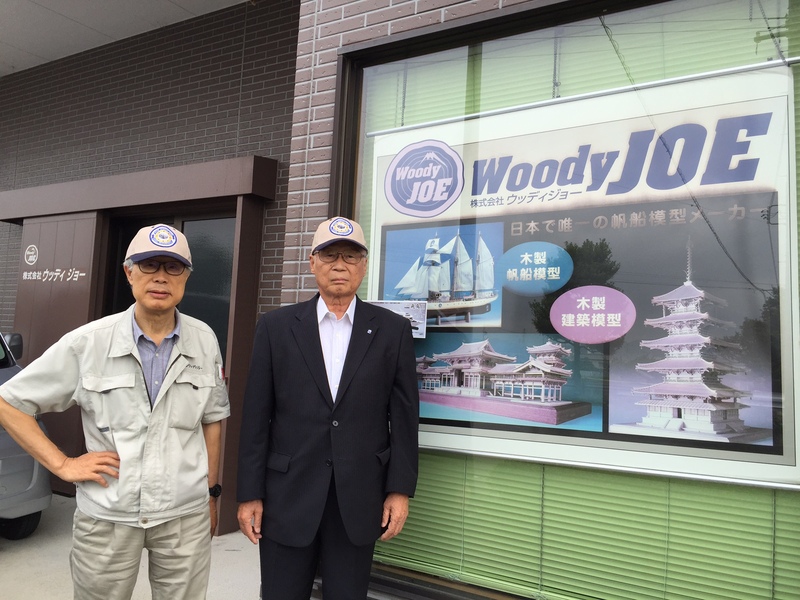 Mr. Tsuneki, the company president, and Mr. Arata, the chief design engineer, show off their spiffy new Hyde Street Pier Model Shipwrights hats in front of the main office in Shizuoka, Japan. The club had several club patches available, and Terry Dorman was able to order the hats for us. Clare Hess had the patches sewn onto the hats before leaving on his trip, which took place in September. This entry was posted in Clare Hess, Club News, Hyde Street Pier, Maritime Museums and Travel, News and tagged Japan, The Rope, Woody Joe by catopower. Bookmark the permalink.